After 4 weeks of travel across the Venterra Portfolio, Alex Khadaronak (Houston North Regional Maintenance Manager) and I finally wrapped up the last Make Ready Boot Camp in Orlando Florida. What a tremendous experience! During our travels we had the unique opportunity to talk in depth with the entire Maintenance Leadership contingent of Venterra and it was our pleasure to not only meet everyone, but share in their experiences and knowledge. 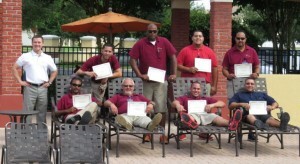 Venterra is fortunate to have such a bevy of maintenance professionals. This series of boot camp classes was directed primarily at the Maintenance Manager level in order to “train the trainers”. Our goal was to facilitate learning among the experts, promote consistency across the portfolio, reinforce Venterra standards for quality, and provide a venue that encourages teamwork across property lines. 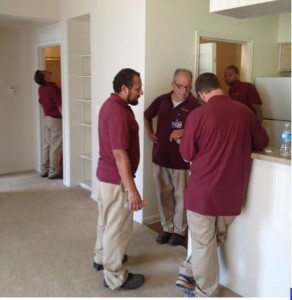 We discussed everything from clearing clogged dryer exhaust to clogged condensate lines; the importance of inspections to the importance of NOT relying on the inspections to get it right the first time. Sharing experiences, trading tips, and openly discussing the finer points of the Make Ready process, I think Alex and I learned as much as anyone in our classes. We enjoyed the enthusiastic involvement in every region and we thank you all for participating, without your involvement, the value of the boot camp would have been greatly reduced. Alex and I would also like to thank those that kept things running at the properties while their leadership was with us in the boot camps. Without your support, the boot camps would not have been possible.